XFX reveals WarPad, a new gaming surface that clamps onto any desk edge up to 2" thick. 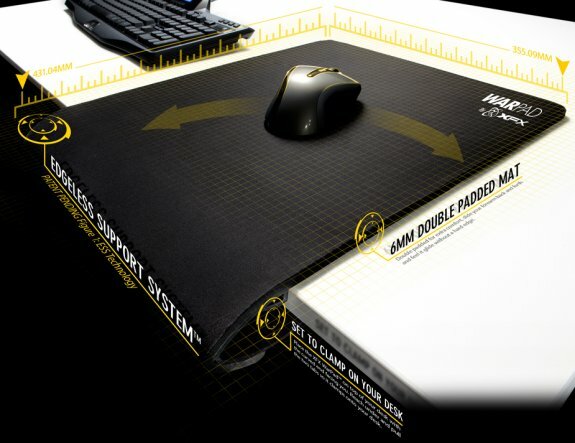 The mousepad measures 16.97" x 13.98" and offers double padding and an edgeless support system that angles and cushions your wrist and forearm. It's sold on XFX's website for $54.99. The XFX WarPad™ isn't rough around the edges. This unique breakthrough in gaming technology is a mousepad designed to eliminate friction and discomfort during long or intensive gaming and working sessions. The XFX WarPad™ creates an edge so comfortable and supportive that your competition might just tire out before you do. Effortlessly clamping onto any desk edge up to 2" thick and only requiring a 2" deep desktop lip to clamp onto, the XFX WarPad™ is easy to roll up and take anywhere you go. With it's unique clamping feature, you never have to worry about this mousepad sliding around. This revolutionary mouse pad comes in at 16.97 inches x 13.98 inches. It's generous size helps to accommodate multi display gaming and projects. For gamers, by gamers, the XFX WarPad™ was meticulously developed by XFX's product developers to meet every intensive users’ needs. The XFX WarPad™ has been tested and appraised by casual gamers, professionals, students and champions of the gaming scene to make sure that it has perfect ergonomics for any user. If you want an edge in your gaming, but not the pain of feeling the edge of your gaming surface, the XFX WarPad™ is just what you've been wishing for. Place the XFX WarPad™ on top of your desk with the curved end facing you. Reach under and pull the two tabs so it clamps onto your desk. Push the XFX WarPad™ towards the back of your desk until it stops on the brace. Place your mouse on top and you're ready to go. Double padded for extra comfort, slide your forearm back and forth and feel it glide without a hard edge.